Workflow Management allows you to set a check on sub-users before they deploy surveys. You will need to assign Workflow Managers to get started. The administrator is a Workflow Manager by default. Anyone – it is not required that this person have a SoGoSurvey acccount – can be made a Workflow Manager. This person will receive an email notification if a sub-user tries to publish a survey that’s set for the workflow. Click Users, Permissions & Workflow option under Survey Tool Settings in the menu on the left. Click the Manage Workflow Managers icon on the top right of the table. All the Workflows Managers will be listed here. You may Create, Edit, and Delete the Workflow Managers. New: You can add a Workflow Manager in this section. Enter and save all details. Edit: To edit or modify the details of a Workflow Manager. Delete: Allows you to delete a Workflow Manager. 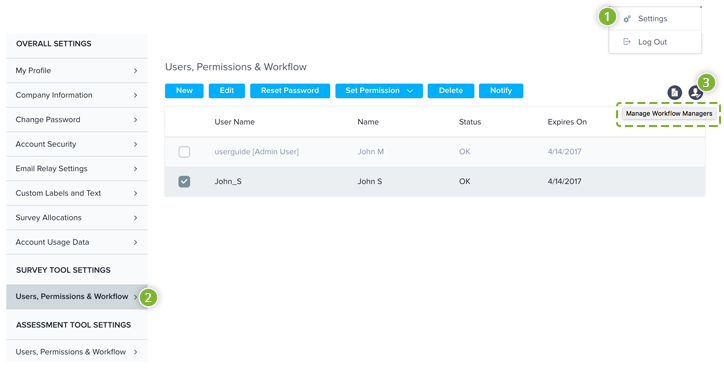 You can have up to 11 Workflow Managers, of whom one (account administrator) is created by default.